Our latest couchsurfer, Ryan the Photographer, taught us how to make a very simple but wonderfully delicious udon dish. Kitz-oo-nay Udon (Fox Udon) is quite simply a strong soy sauce, udon noodles, some carrots, and inari tofu skins. (These are the same skins stuffed with rice that can be found in sushi places, and which we made for the second course. 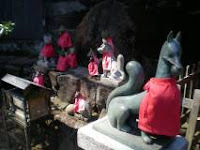 Interestingly, Inari is also a Japanese kami whose minion is the fox. We just happened to take the photo at left the same day while hiking at Mount Takao.) Ryan often made it during the winter months while living in Hokkaido, and even though it could become more complex with other vegetables he likes to keep it pretty simple. The whole process was pretty simple. Fill a medium saucepan about three-quarters full of water, and pour in about an inch to inch and a half of the strong soy sauce. Put in the precooked udon noodles (available everywhere here), the carrots, and inari skins. Gently boil until the carrots are soft enough to eat. Serve in ramen bowls (large, large bowls) with chopsticks, and slurp your way to heaven. The inari rolls are also quite easy. Ryan shared his version of the Japanese recipe - sugar and sushi vinegar - that has a stronger flavor. He dissolved beet sugar made in Hokkaido (think unrefined sugar) into about 3/4 cup of sushi vinegar, and then stirred that into about 1 3/4 cups brown rice. 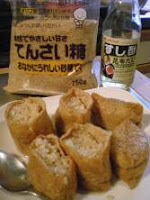 We then gently opened up the inari skins, spooned in the rice, and topped it off with a few slices of pickled ginger. These were gone in about ten seconds. I was lucky to get a photo.